Alison Can Read: Day of the Doctor: 2 Hours to Go!!!! I am so very excited. I've only been a fan of the show since May but I have become unbelievably obsessed. I cannot wait to see the Tenth Doctor (My Doctor), Rose, Eleven, and Clara all together. I only wish Nine, Donna, and Captain Jack could be there too (who knows, maybe they'll show up, but I doubt it). 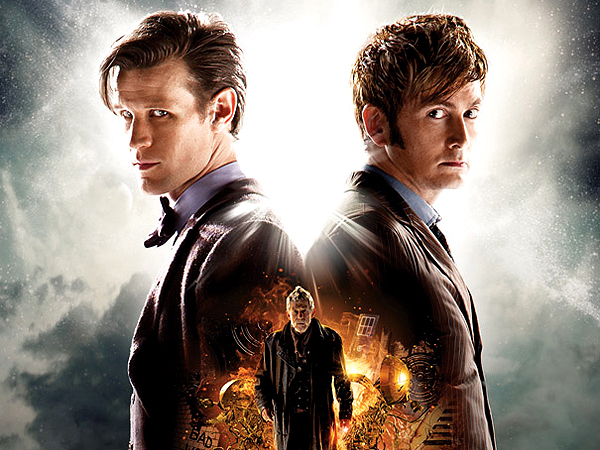 Who else is going to be watching the Fiftieth Anniversary today? Enjoy! My son is off to a Dr. Who viewing party that he's been eagerly anticipating for months. I've only watched a couple episodes with him so I can't talk the talk, but I'm sure I'm going to hear all about it later. It does sound exciting. We are so excited..it is like Christmas here..we have had Doctor Who on all week. We ordered pizza, have chips and drinks and are ready to go! It was so good. It was so so good. I may have actually cried. Okay, I don't watch this series. I know. I know. I need to watch it.